James Forrester ’59 received the 2009 Lifetime Achievement Award from the American College of Cardiology in March. Each year, the award is presented to an individual who has amassed 30-plus years of outstanding achievements in the field of cardiovascular disease and has served as a role model through service, research, and teaching. Early in his career, Forrester and colleagues developed and used catheter technology to define the effects of drugs on cardiac function in critically ill patients. Later, he led a team that used fiberoptics to directly visualize, for the first time, clots inside the coronary arteries of patients with acute chest pain. “Forrester’s extensive body of work,” says Prediman Shah, director of the Institute’s Division of Cardiology and the Atherosclerosis Research Center, “has improved our understanding of ischemic heart disease and hemodynamic consequences of acute myocardial infarction. 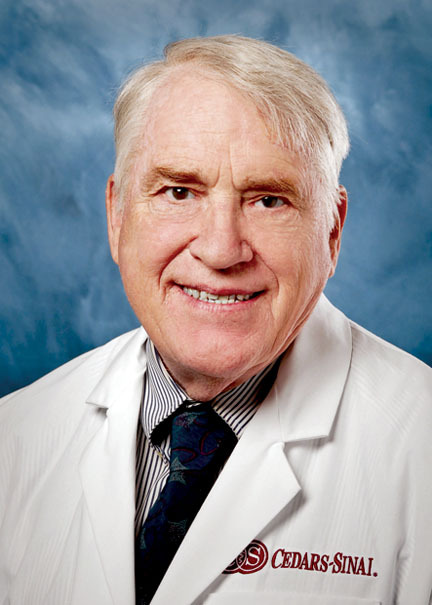 Beyond that, he has served as a highly regarded mentor to many.” Forrester, former chief of the Division of Cardiology at the Cedar Sinai Heart Institute in Los Angeles, is currently the George Burns and Gracie Allen Professor of Cardiovascular Research at the Institute. Jim - just read about your latest achievement in the SwarthmoreCollgege Bulletin. CONGRATULATIONS. Well deserved.